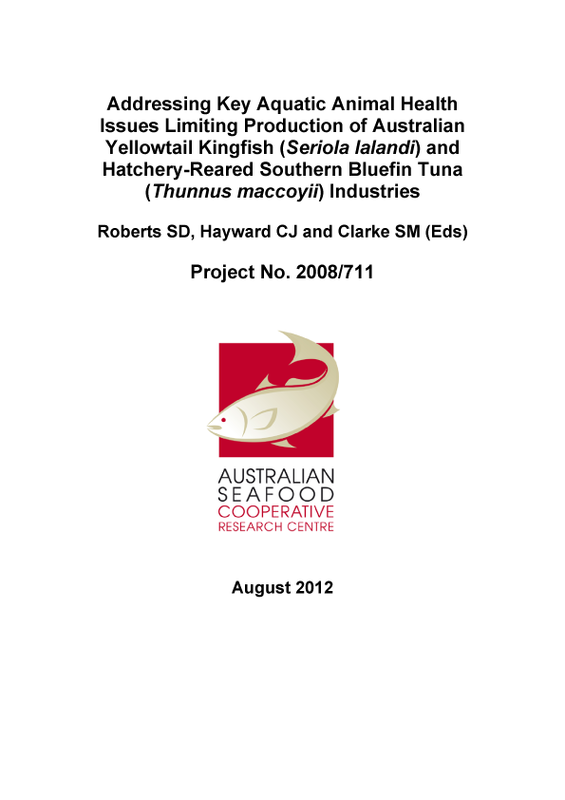 Clean Seas Tuna (CST) was, and continues to be, the largest Yellowtail Kingfish (YTK) producer in Australia, with hatcheries at Arno Bay and Port Augusta, and growout facilities in Boston Bay, Port Lincoln; Arno Bay; and Fitzgerald Bay, near Whyalla. Disease can have serious impacts on aquaculture, resulting in high mortalities and lost growth which decrease profits. The prevention and management of disease can also dramatically increase the costs of production. Furthermore, ectoparasites can heavily infest sea-cage cultured YTK, ultimately causing high mortalities if left untreated. Parasite burden can influence the performance of fish (growth and condition), reduce product quality (and thus affect market value), and even cause substantial mortalities on-farm if left untreated. However, treatment and management is costly and labour intensive. Test the efficacy of selected in-feed medications in reducing burdens of gill and skin flukes on YTK in onshore tank and field sea-cage trials. Over the range of salinities experienced in Spencer Gulf, experimentally qualify the effects on performance (growth and apparent food conversion efficiency) and blood osmolality of YTK. Develop a health protocol for hatchery-reared larval SBT and preserve samples for future archival diagnostic analyses. PZQ and FBZ when used as in-feed medications and fed to YTK in tanks and sea-cages, did result in decreases in fluke abundance, although the desired high levels of efficacy were not achieved. The relative benefits and disadvantages of using PZQ as compared to FBZ were confirmed. PZQ medicated feed, as prepared, was shown to have poor palatability. The results obtained along with information from the available scientific literature for fish under fully controlled conditions, clearly identified that there is a need to achieve a critical known anthelmintics level within the blood plasma of treated fish, with the challenge being to identify the appropriate dosage to add to the feed and the frequency of fish feeding that best addresses the variability in feed intake typical of any population of fish in a sea-cage. Recommendations were made on how to enhance any future evaluations of this type.